Pacesetters are a valuable part of each General Campaign. These businesses and organizations make a commitment to hold their workplace giving campaign before the official kick-off and help Hawaii Island United Way get a head start on reaching our goal! Jason Ayers, Asst. 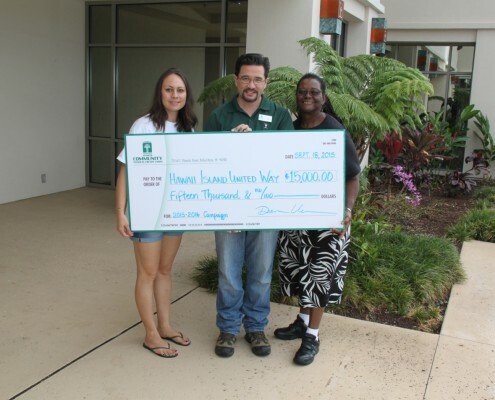 Vice President-Loan Manager of Hawaii Community Federal Credit Union presents their contribution of $15,000 to Hawaii Island United Way’s President, and Campaign & Special Events Coordinator Sasha Payao on September 18th, 2015 in West Hawaiʻi.